When it is time to “cut through the B.S.,” one card in the Tarot deck will do the cutting for you: The Ace of Swords. This is the card that appears when communication is in need of being clarified. That is a nice way of saying that when someone is giving you a snow job about something, the Ace of Swords is with you to cut those words to shreds and find the clear meaning of them. The Ace of Swords delivers the reality of the situation to you. This is not always easy to accept, as often it is you who have been lying to yourself, denying the truth about a relationship or other intense situation in your life. This card perseveres in a quest for what is real, but your idea of what that reality might actually be is not guaranteed. Under a light gray sky dominating a distant mountainous landscape, a glowing white hand appears from out of a wispy dark cloud on the extreme left border of the card. This hand has white rays of light emanating around its tight grip on a large silver sword. The sword points directly upward. Near its tip hovers a gold crown. On one side of the crown hangs a laurel leaf, on the other a long, dropping palm frond. The Tarot Deck’s four Ace cards (Ace of Cups, Ace of Wands, Ace of Pentacles and the Ace of Swords) are all simple illustrations, often the most minimally designed cards in a Tarot deck. But these cards carry a maximum punch. Each Ace speaks the loudest for its suit and carries the most impact over the things that are under its influence. The hand and cloud are indicators of a divine influence. The landscape assures us that this influence is being meted out here on Earth. The crown represents absolutes. When a king or queen wears a crown, it makes certain who is the ruler. The laurel leaf is what the ancients wore as a crown of victory. The palm branch references Christ’s entry into the city on Palm Sunday, less than a week before he made the ultimate sacrifice. The crown and this hanging greenery are the simplest of illustrations but they represent the ultimate in absolutes. Swords are the suit of ideas, words and the cerebral plane. Communication done under the auspices of this card is communication that is most definite. Each Tarot reading has positions for the cards to land. They are designated to represent your past, your present and your future. This changes the meaning of some cards. It also focuses the influence on different parts of the personal narrative of your life. When the Ace of Swords is in the past position, you made a great realization at some point leading up to today. You can define your life by the before and after of this moment of clarity. Perhaps it was in seeing the lies that were holding together a relationship that was not what you believed it to be. Maybe you ended a cloudy period of partying too hard too often and have enjoyed the results of your decision in favor of clarity. Regardless of the personal details, your discovery of what was being obscured was a defining moment in your past and is part of the foundation of where you are now in your journey. 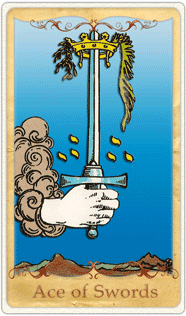 The future position is a great place in your Tarot reading to have the Ace of Swords land. This is a beacon of coming courage that will strengthen your resolve to get to the heart of the matter. Of course, the downside to this may be that your present life is actually not in synch with reality and the longer you wait to deal with issues of the present in order to move toward your future, the longer it will be until you have a clear indication of what is really going on with the life you have built for yourself. The Tarot reading is always a spread of cards. No card stands out individually in the group free of influence from the cards around it. This makes each Tarot reading a unique amalgamation of influences tailored to your situation. When the Justice card appears in a reading accompanying the Ace of Swords, not only will your situation soon be clarified, there will be an absolute and finite outcome related to your discovery of the truth. Be careful what you wish for, you just might get it. Next to Justice, the card that best augments the Ace of Swords is Strength. The results of what the Ace of Swords reveals will make you a better, wiser person. Speaking of wisdom, The Hermit and The High Priestess cards bring a philosophical perspective to the revelations that the Ace of Swords indicates are on the way. With the Hermit, you will be able to incorporate these truths into your everyday life, but have a difficult time relating them to anyone else around you. These are deep, personal truths. With The High Priestess, you will reach a higher level of consciousness than your social group and may slowly drift from those with whom you were once so close. Your friends may be staying children as you become an adult and move on. The Ace of Swords works well with The Magician card, as it clarifies that the magic experience you are feeling lately is not an illusion, but the excitement of finally having a grip on reality. The Magician can obfuscate as easily as he illuminates. The Ace of Swords assures that a vision of the world as it really is will come to you in all of its raging beauty and truth.